It’s hard to see a hotdog as a parent of a toddler, and not immediately start singing the Micky Mouse Club House song. Just like it’s hard to put your mail out without singing “Here’s the mail it never fails, it makes me want to wag my tail.” Remember when your brain was full of things other than kids show song lyrics? Yeah, we do too. What fond memories. But we wouldn’t change our faulty memories for anything, and we bet you wouldn’t either. Just look at your cute little munchkin. Yes, the same one who drew in magic marker all over his bedroom walls two days ago, and also tried to eat sand from the play ground because “it looks like gramcrackers!” You know he is going to grow up to be a hot dog. A hot dog, hot dog, hot diggity dog, just like you! 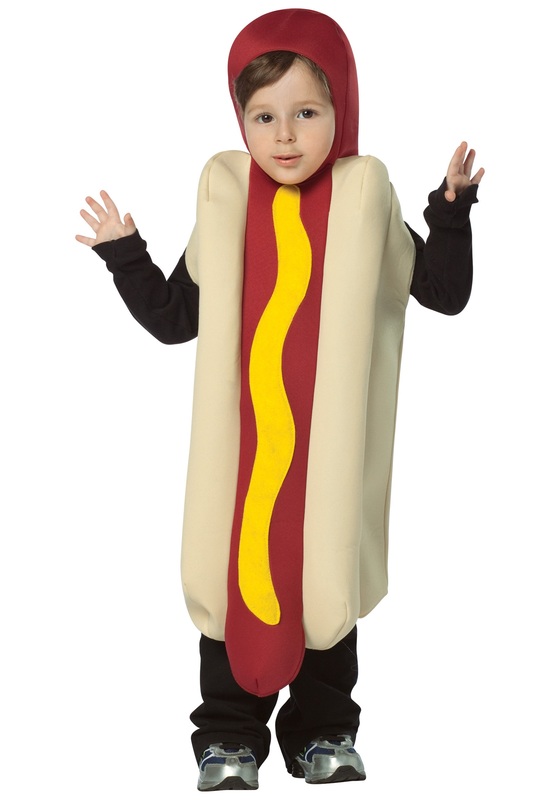 But why make him wait to be a hotdog until he grows up? Why not slip him into this Toddler Hotdog costume now? Take him out to a baseball game? Get him a ball park frank, and watch as he pretends to be one of the athletes on the diamond? Or just watch one of the Micky Mouse’s Club House that you have saved on the DVR? The ones you are NOT allowed to delete under any circumstances. Watch as you cute little hotdog dances around your living room, following Micky’s steps.